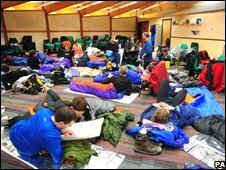 They had expected to be bivouaced on the fells but instead mountain marathon runners found themselves camping in a school after atrocious weather. The smell of bacon butties and the lure of tea and coffee was enough to get the 100 race competitors up and running again. They had camped out under tin foil blankets in Cockermouth's High School, refugees from the cancelled Original Mountain Marathon. Breakfast was being served and everyone had a story to tell of the events of the last 24 hours. Adrian Netherwood, 49, from Shipley, West Yorkshire, said he had finished the race - despite the "absolutely horrific weather". He added: "Our car is parked 15 miles away and we know it could be under water. "We're more or less resigned to the fact that we'll have to stay in Keswick overnight until we can sort things out. Trouble is, our credit cards are still in the car." Most of the others runners staying in Cockermouth overnight also did not have to be rescued from the fell tops . I wouldn't normally have carried so much gear but did so because of the weather. They had made their own way down into the valleys after finishing their event. And they were diappointed the annual competition had to be cancelled for the first time in its 41-year history. Some feared it will mean more controls being enforced on their sport in the future. Martin Teal, 38, a financial advisor from Guiseley, near Leeds, said the runners were all experienced and knew how to navigate on the hills. "I've been in training for this event for six months. We were all prepared. "We'd been following the weather forecast for days and I'd repacked my kit to take account of it. "I wouldn't normally have carried so much gear but did so because of the weather. "I don't want to die out there. I've got a family and I always make sure I've got everything I need." As Sunday wore on, the number of people still not accounted for fell rapidly as runners contacted race organisers and the police. Coaches were brought to the refuge centre at the school to take the competitors back to their cars. Many have been flooded and will need to be towed away but it is still not dampened the hearts of those taking part. "I'm just disappointed," said Mr Teal, staring up at the blue skies above Cockermouth. "You look at today's weather - and it's great. Perfect conditions . Why wasn't it like this yesterday?"